From the creators of King Kong (1933) comes an impressive historical epic with a great storyline and effects. WB USA R1 DVD. After the incredible stop-motion sucess of King Kong (1933), the director, producer and special effects team were quick to attach themselves to another big effects project. They chose the real-life epic story of Pompeii, destroyed by the volcano Vesuvius in 79 A.D. The eruption itself would be a special effects masterpiece, but they needed a storyline to preceed eruption. Inspired by the settings portrayed in the Edward Bulwer-Lytton novel of 1834, but completely altering the characters and storyline, the script writers created a complex story of redemption and fall around a resident of the city. Marcus (Preston Hale) is a simple blacksmith in Pompeii; living with his wife and baby son, he declares himself to be as happy as any man despite his poverty. However his happiness ends when both are killed by an errant chariot and he is unable to afford the help of the doctor. Realising that money is the key he heads to the arena to compete in the dangerous but well paid gladiator fights and rapidly rises to become a hero. Things change when he discovers that his victory in the arena left a small boy, Flavius, orphaned. Adopting the boy as his own, Marcus starts to become cautious in his combat and is soon injured and unable to compete. Moving into work he despises, Marcus is forced to capture slaves from Africa to compete in the arena; yet on a trip to Judea to purchase horses, the lives of Marcus and Flavius are permenantly changed as they encounter the brooding Pontius Pilate (Basil Rathbone) and an enigmatic teacher and healer. Many years later, Marcus has become everything that he had previously despised - the richest man in Pompeii, he runs the arena where slaves are killed for sport. Yet history will catch up with him, and money cannot protect a man from the wrath of nature... or God. 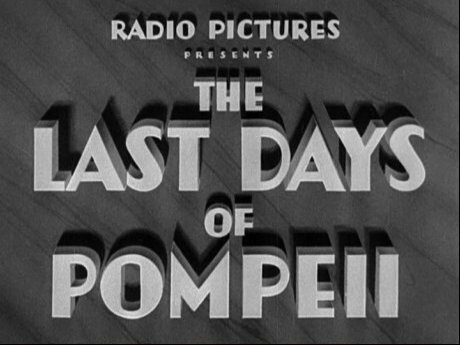 For a film that could have become little more than a special effects reel, The Last Days of Pompeii (1935) boasts a very strong and interesting storyline that can even make the viewer forget to expect the film's inevitable last reel climax, and would stand perfectly well as a film on its own. Characterisation is strong, Marcus is taken on a strong fall and redemption journey and by the emotive ending we really feel for him; the climax is strongly plotted and avoids a few potential clichés along the way. The story has an unexpected religious element to it, centered around Marcus' encouter with Jesus near Jerusalem - these sequences are presented unskeptically, rather surprising to a jaded modern viewer. Pacing varies from fast to slow and the film can feel like it runs much longer than the 96 minute run-time yet the storyline does cut away jarringly at times, and throughout most of the film, action scenes are referred to but never seen - the limited budget and the strict film regulations at the time probably prevented the big battle scenes or gladiator fights being shown in any detail. It is worth noting that the script is historically inaccurate - to meet Jesus it must place Marcus in Judea at around 30 A.D., and while the eruption occured in 79 A.D., the characters age only ten years or so between the scenes, however this is largely ignorable for the sake of a good story. Although I cannot vouch for the precise accuracy of all the scenes and settings, to the untrained viewer they do look very authentic. For a 1930s production, the film boasts impressive use of matt-painted backdrops, a big cast of extras, and some amazing model destruction in the finalé - although viewers more used to the CGI wizardry of Gladiator (2000) and its kin might have trouble adapting to the effects of an earlier age. The camera work is standard but competent, working well with the effects, while the music is very similar to that used in the earlier King Kong (1933). Preston Foster gives a rare leading performance here. Usually more at home as a heavy in gangster or noir pictures, he demonstrates an effective range, managing to be a believable strong man but with a deep emotional side. Basil Rathbone gets limited screentime, but makes a good performance as the historically controversial Pontius Pilate who sentences Jesus to crucifixion, his typically aloof tones work well as those of a Roman nobleman. Look out for early Universal Horror stalwart Edward Van Sloan as Marcus' neighbour at the start of the film. The Last Days of Pompeii (1935) boasts a good cast, strong special effects and a very impressive storyline that almost manages to make the volcanic climax a surprise. This little known film is certainly worth a look for any fans of 1930s cinema and early epic cinema from the likes of Cecil B. DeMille, it is also an interesting chapter in the portrayal of Jesus onscreen and worth a watch for anyone interested in this cinematic legacy. Directed by anyone interesting? Ernest B. Schoedsack - the man behind the original King Kong (1933) and its sequels. Very interesting for fans of 1930s cinema or the early epics. Good soundtrack? Standard big orchestral score. Visuals Original Aspect Ratio - 1.33:1 fullscreen. Black and White. The print quality is very good, frequent speckles and scratches but never unwatchable. As good as 1930s films can look. Audio English language mono sound. Some light hiss on the audio, and sound levels are very low, otherwise fine. Subtitles English, French and Spanish. A very good film - a good script, good cast and great effects all come together with surprising depth. A good presentation of the film, print probably looks as good as it ever did. Total lack of extras is a shame. All text in this review written by Timothy Young - 20th May 2006.